Co-owner Sinia Jazwi outside of the refurbished Rattler in South Shields. It’s full steam ahead for a landmark seafront pub and restaurant in South Shields after a £70,000 revamp by new owners. The Marsden Rattler, on Sea Road, has been taken over by Sinia Jazwi and Tom Cram, who have reopened the landmark railway carriage in time for Easter. The landmark venue has reopened and undergone a revamp. The pub had closed its doors earlier this year. Sinia, who also owns The Chichester Arms, and business partner Tom, who co-owns the Sandhaven Beach Chalets next door to the venue, say they leapt at the chance to restore the Rattler to is former glory. The pair picked up the keys in February and since then have been working to get the pub and restaurant back on track in time for its Easter weekend launch. Sinia, 35, said: “The Rattler is in such a significant place on the seafront and it has become iconic. The inside of the Rattler following its refurbishment. ''New seating is aimed at giving customers the feel of an old fashioned railway station. “I found out that it had shut and straight away I thought; ‘I really want it’. 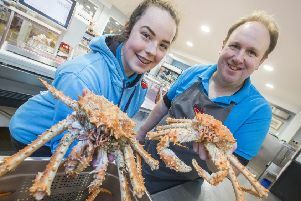 It re-opened to customers on Thursday, March 28, and bosses say it will be fully operational by next weekend - with a full menu, entertainment and extended opening hours. Sinia said part of the refurbishment has seen the team strip back layers of paint on the outside of the railway carriage to uncover its original colours of maroon and ivy. Meanwhile the inside has been done out in a shabby chic look, to give it the feel of an old fashioned train station. The shabby chic look of the revamped Rattler. Sinia added: “It has been around-the-clock work since we got it. We spent two and a half weeks just cleaning it. “We have done out the inside with a shabby chic feel. Pub bosses say the venue still has its terrace area and big conservatory so customers can dine with a view. Tom Cram has reopened the Marsden Rattler with Sinia Jazwi. The venue currently has a team of 10 staff with more due to join the ranks at Easter. Sinia continued: “I am delighted with how it looks and we plan to continue to invest. The pub is currently serving food from 12pm to 8pm, Monday to Saturday and a Sunday Carvery from 12pm to 6pm, with extended opening hours planned after Easter. From May onwards it will serve breakfast. Over the Easter weekend it will be open 12pm to 1am, featuring live entertainment including in-house DJ’s.